Not a bad licensed casino, with fast payouts. High-quality website design, a huge set of slot machines. Round the clock support service. Individual bonuses for new and old players, with a small wager requirements. 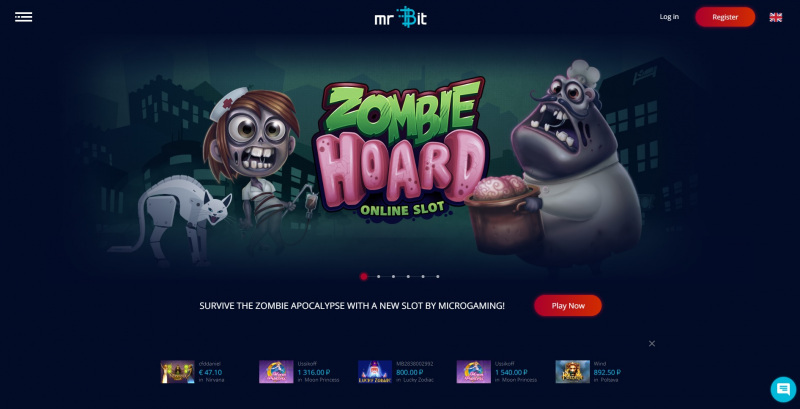 A new high-end Mr Bit casino was launched in 2018 and caught the attention of gamblers. 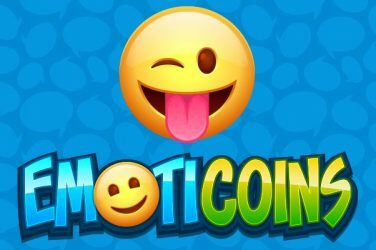 This platform has many distinguishing features, some of the most noticeable are the flat design of the site and the ability to create both fiat money and cryptocurrency accounts.. Curacao license guarantees fairness of gaming at this casino. By fulfilling all the deposit requirements the new players can start their Mr Bit experience with 1,000 EUR and 250 fs. 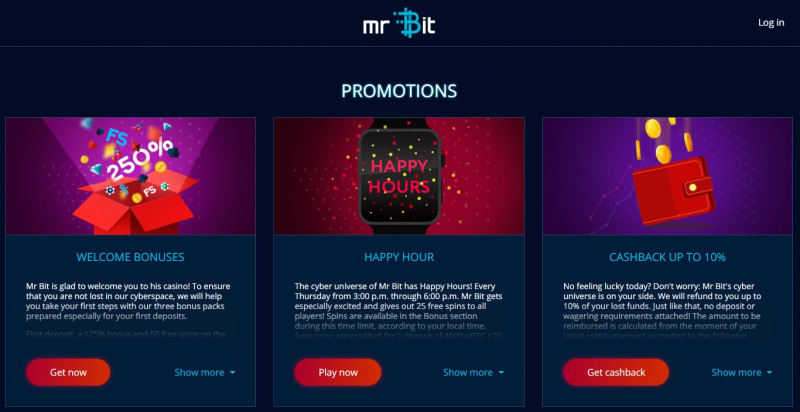 Among other bonuses which are offered by Mr Bit’s team there are bitpoints, awarded to all players’ accounts every time they make deposits and exchangeable for money. The exchange rate is more favorable for the higher statuses players. Moreover, such players get greater return on lost funds, which at maximum may reach 10%. The VIPs are offered the best benefits, including invitations to special events. In addition to the Bitcoin users can also register accounts in other Top-8 cryptocurrencies: Bitcoin Cash, Ethereum, Ripple, Litecoin, Monero, Dash, NEM, Dogecoin. Ordinary EUR, ruble, dollar, and baht accounts are also available. Swedish and Norwegian krona will soon be on the list too. Mr Bit has tried to ensure that making deps and withdrawals was fast and convenient for the users with different accounts all over the world. Holders of cryptocurrency accounts may cash out wins with the help of their crypto wallets, or use the services of payment systems, if they do not have such wallets. Payment systems for other users include Visa, Visa Electron, Maestro, QIWI, YandexMoney, WebMoney, Skrill, Moneta.ru, Neteller, MasterCard (within RF), Entropay, online banking (Thailand, Indonesia), iWallet and some more. Check out the whole list on the site. The wins can be cashed out within 24 hours on bank days or within 48 hours on weekends. The monthly withdrawal limit reaches100,000 EUR. English or Russian-speaking support service is there to help you out 24/7 via live chat, e-mail or phone. The operators are devoted to provide the best services and always be helpful to the users. Welcome Bonus offer: 125% up to $250 Claim now!